I am never a fan of bringing back well-known television shows and trying to revamp them so it appeals to a younger market. So when I heard about the comeback of 'Birds Of A Feather' I just was not sure it would work and have that same appeal that it had in the 90s. The original Essex ladies are back and are ready to show 'TOWIE' how it is really done. 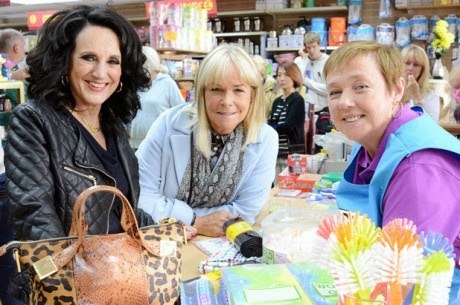 Sharon (Pauline Quirke), Tracey (Linda Robson) and Dorien (Lesley Joseph) are now living different lives but have not changed one bit. When Sharon and Tracey reunite at Dorien’s 'Fifty Shades Of Grey'-style book signing, Tracey invites Sharon to live with her after the failure of Tracey’s latest relationship. To make matters worse for Tracey, the creator of 'Fifty Shades Of Grey' is suing Dorien and with all her assets frozen she begs her way into Tracey’s home. As well as Sharon and Dorien, Tracey’s two sons Travis (Charlie Quirke) and Garth (Busted's Matt Willis) with Garth, who recently travelled around Australia and has brought back his girlfriend and her daughter along to all stay in Tracey’s house. My only doubt with this comeback is how long will the magic last for. Yes, the ratings are doing really well for ITV, topping Thursday night entertainment after the soaps - however, are people watching it just to relive some of the 1990s or have this Essex lot attracted a new fan base that will be willing to go with them for the long haul. ITV have dealt a big blow to the BBC by taking on this remake and giving it the perfect slot for the whole family to sit down and enjoy. 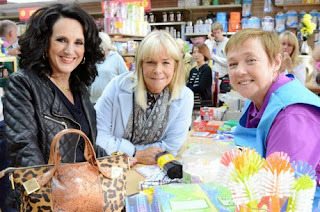 It is great to see Tracey, Sharon and Dorien back, I would have preferred maybe a one-off special to create more of an impact but the ratings speak for themselves. ITV would also be missing a trick if they did not produce a Christmas Special but we will see where these Essex lasses take us. Catch 'Birds Of A Feather' every Thursday at 20.30 on ITV. There are many professions that I could see myself doing, always believing I can do anything as long as I put my mind to it. Teaching however is not one, especially with today’s youth. From what I have seen and heard of themm I just do not have the patience or the cool calm head to be dealing with teenagers. 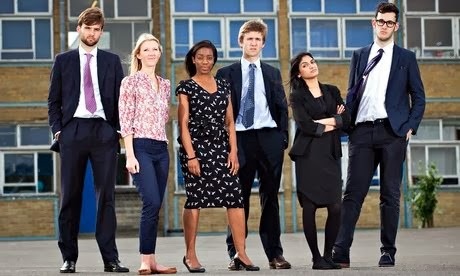 BBC Three’s new show 'Tough Young Teachers' allows us to see six new teachers start their career in the teaching world. It does not look easy, not one bit. Charles Wallendahl is a graduate from Oxford who teaches R.E to quite a few difficult children. I like the fact that Charles does not allow his class to run a mockery and is willing to deal with the troublesome children head on, even if that means him facing verbal abuse. Some people may find his approach wooden and even quite cold but at the same time he is generally able to control his class. In contrast Meryl Noronha is struggling to keep her classes in order, which is quite painful to watch at times. It is kind of like watching a puppy drowning in water and you simply want to rescue it. Currently, I wouldn't feel confident having Meryl teach my children - however, she might be able to clear the hurricane that is surrounding her. Finally we have Claudenia Williams, who I know from going to the same high school. Yes, her teaching methods are very odd - personally I would not be making my students wear a crown and maybe not make such a big deal of a drawing, especially if I did not know what it was. However, you can tell she actually wants the best for all her students and I have gained a lot more respect for her since watching this show. 'Tough Young Teachers' shows us that teaching is not as simple as it is made out to be. There are long hours and dealing with a very verbal youth cannot be easy for anyone. I know quite a lot few people that have become teachers and all I can do is salute them, as teaching is not as simple as people are made to believe. There are other professions such as police and fire fighters I would love to see if this show is to be brought back. 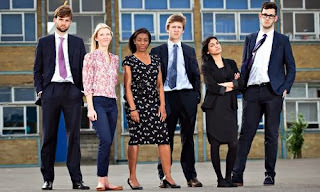 Catch 'Tough Young Teachers' on BBC Three every Thursday at 9pm of catch up on BBC iPlayer.